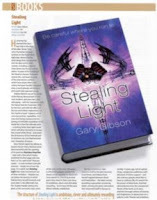 "Gary Gibson opens by taking on board a lesson Harry Harrison once demonstrated with the opening of his peerless Stainless Steel Rat - start with a line which hooks, and finish the first page with one that's so 'You said what?' that any reader - or overworked slush-pile assessor - simply has to turn the page." That's not to say the reviewer doesn't have some caveats - and those make for interesting reading, because it's an opportunity to sort of look inside your own head from the outside. But still, it's a big review, and a very, very positive one. Yay for me.